With botanicals from around the world, PowerGize helps sustain energy levels, strength, mental and physical vibrancy, and vitality when used in addition to physical activity. * Although both men and women can benefit from PowerGize, it’s custom-formulated for men. Don’t just be a weekend warrior—live life better than the glory days with PowerGize! Use this powerful supplement to help support balanced energy levels, sustain mental clarity and alertness, and maintain a healthy immune system. * Many men look to improve their performance, stamina, strength, and muscle recovery as they age. PowerGize AWAKENS and INSPIRES your BEST Self! 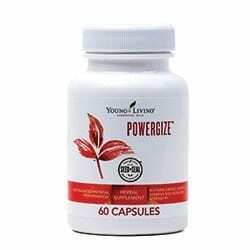 Because the need for energy, vitality, and virility is real, PowerGize uses ingredients found in ancient cultures and exotic lands to support your inner athlete. It is custom-formulated for men. Utilizing the exotic ingredient of Eurycoma longifolia, to help support the male reproductive system. * It also contains compounds that are known to increase muscle size and strength. Therefore enhance tone, and accelerate recovery in both men and women. PowerGize is infused with Idaho Blue Spruce, Goldenrod, and Cassia essential oils. First of all, infusing nutritional supplements with the added benefit of essential oils enables nature’s living energy to provide internal bodily support. Young Living’s supplements contribute to overall wellness. This is done by balancing dietary insufficiencies and infusing the body with essential oils. They are naturally derived and also plant-based to care for the entire family. Our supplements include several unique products including NingXia Red liquid nutrition, Slique weight-management, Foundation Nutrition whole-body support, Targeted Nutrition that target specific needs: from heart and brain wellness to digestive support, Cleansing Nutrition with enzymes and probiotics, Healthy Eating with Vitality dietary essential oils to einkorn grain and healthy snacks. * The information on this website is intended for educational purposes only. It is not provided in order to diagnose, prescribe, or treat any disease, illness, or injured condition of the body. The author and printer accept no responsibility for such use. Anyone suffering from any disease, illness, or injury should consult with a physician or other appropriate licensed health care professional. * This site does not provide medical advice, diagnosis, or treatment.